Class 6A and 5A semifinals may be one of the toughest in the nation as far as semifinal brackets go. Colquitt wins on the road, Norcross is the defending champion, Tucker averaged close to 50 points a game during the regular season yet only 26.6 points per game in the postseason, McEachern has their quarterback back with plenty of playmakers, Creekside is inspired and North Gwinnett plays to the final horn. Those are just a few of the things that the Georgia High School Football quarterfinals offered up. We begin in 6A where there no undefeated teams yet all are currently ranked nationally ranked or have been this season. 44-7 is combined record of the semifinal teams with all seven losses coming to playoff teams. North Gwinnett is the only one-loss team in the field. North Gwinnett’s only loss was to Collin’s Hill and defeated Norcross in the regular season. Norcross’ non-Georgia loss came to the top nationally ranked team Booker T. Washington (FL). Booker T. Washington is undefeated and are in the Florida Class 4A semifinals. Colquitt County has two losses with only one to a team from Georgia, Camden County. Colquitt’s other loss was to Hoover (AL) who is undefeated, nationally ranked and will face Auburn (AL) in the Alabama 6A finals. McEachern’s losses were to region opponents North Cobb and Hillgrove. North Cobb lost to Colquitt County in the second round and Hillgrove lost to North Gwinnett in the quarterfinals. Hillgrove defeated Camden County in the second round. North Gwinnett is the only one-loss team in the Georgia 6A semifinals. McEachern defeated Collins Hill 35-32 to advance. McEachern jumped out 21-3 lead but needed an 86-yard punt return for touchdown by Taj Griffin and a late interception to seal their semifinal slot. Griffin finished with 153 yards rushing and a touchdown. Alizee Chubbs rushed for two touchdowns and Bailey Hockman passed for a touchdown. Ty Clemons returned to action for the Indians coming off an ankle injury passing for 10 yards and rushing for -5 yards. Tyler Herman passed for two touchdowns, Tyler Henderson rushed for a touchdown and Dwayne Smith returned a punt for a touchdown for Collins Hill. McEachern will host North Gwinnett in the semifinals after winning the coin flip between two teams that are both three-seeds out of their regions. McEachern won the only previous meeting between the teams in 2011 in the Georgia Dome. North Gwinnett did what they have done all season, find ways to win. The Bulldogs came from behind for the second week in a row in the playoffs to advance with a 35-31 victory over Hillgrove. CJ Leggett toted the mail for North Gwinnett rushing 40 times for 141 yards and four touchdowns. In the end it was North Gwinnett’s defense setting up the go-ahead touchdown with a fumble recovery leading to Hayden Sphire hitting Daniel Imatorbhebhe for a touchdown with a little over a minute remaining to give North Gwinnett the 35-31 lead. Hillgrove would have several shots at the end zone on their final possession but North Gwinnett’s secondary answered the bell each time knocking down pass after pass sealing the win with an interception as time expired. Hillgrove’ Richarde Bagley rushed for four touchdowns but was playing at the quarterback spot when he fumbled late in the fourth quarter setting up North Gwinnett’s final touchdown. Justin Denton caught a touchdown pass from Elijah Ironside for Hillgrove. North Gwinnett is a co-Region 7 champion and will play at McEachern in the semifinals in their fourth consecutive road playoff game. Colquitt County jumped out early on Dacula and cruised to a 42-17 victory. Daniel Mobley passed for three touchdowns and rushed for another. Bull Barge, Colquitt’s leader in tackles, returned an interception for a touchdown and running back Sihiem King rushed for a touchdown. Kiel Pollard caught a touchdown and rushed for a touchdown as the Packers improved to 12-3 in road playoff games since 2009 under head coach Rush Propst. Colquitt will go for their 13th road under Props win next week at Norcross. Norcross defeated Colquitt in a scrimmage earlier this year in August, last year in a scrimmage in Moultrie and in the semifinals at Norcross. Norcross held Lowndes rushing attack under 100 yards and advanced with a 28-7 victory. Norcross’ quarterback AJ Bushed rushed for a touchdown and passed for two touchdowns while Josh Boyd added a rushing touchdown. Lowndes’ only touchdown came on Austin Dixon to Malik Roberts pass in the fourth quarter. Norcross will host Colquitt County. In 5A… three of four teams are undefeated and Gainesville, the lone team with a loss, is the defending champion. 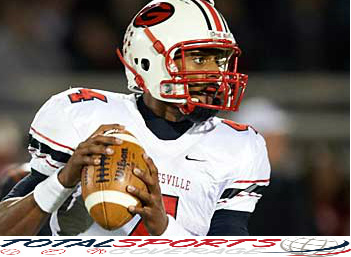 Deshaun Watson leads Gainesville into their third consecutive semifinals. Mundy’s Mill gave Gainesville everything they wanted but in the end it was too much Gainesville and Deshaun Watson. Watson was a part of all six of Gainesville’s touchdowns as the Red Elephants advanced to the semifinals for the third consecutive season. Watson played most of the game with a slightly injured left (non-throwing) shoulder. Rodney Smith rushed for over 200 yards and two touchdowns for Mundy’s Mill. Mundy’s Mill finished the season 8-5, their best record in school history. Gainesville’s only lost was to 3A semifinalist Buford with a victory over ML King (out-of-state win over Florida 7A playoff team Blanche Ely) in the playoffs. Gainesville will travel to undefeated Tucker in the semifinals after Tucker won the coin toss. Joe Farrar rushed for two touchdowns, Duke Shelly returned an interception for a touchdown and Eric Webber continued his steady work in the kicking department adding two field goals as Tucker shutout Ware County 29-0. Tucker is the region 6-5A champion where three of the four teams in that region advanced to the second round of the playoffs, Stephenson and Mays are the others. The Tigers have a victory over 3A Cedar Grove (eliminated in the second round). Tucker will host Gainesville in the semifinals in their fourth consecutive home playoff game. Creekside defeated North Paulding 41-14 on the road to advance to the semifinals. Felix Harper passed for a touchdown and Dexter Knox rushed for four touchdowns for the Seminoles. Creekside remains undefeated and will face Kell in the semifinals. Creekside defeated three class 6A teams two of which made the playoffs in Langston Hughes (eliminated by McEachern in second round) and Westlake (eliminated by Camden County in first round). The Seminoles were region champions and defeated playoff region opponents Whitewater(lost to Warner Robins in the first round) and McIntosh (lost to Northside-Warner Robins in first round) in the regular season. In addition to their victory over North Paulding they defeated Harris County and an improving Lakeside-Evans in the postseason. Creekside will host Kell in the semifinals. Kell jumped up on Warner Robins early and often. After Warner Robins added some late touchdowns Kell advanced with a 52-28. Kell’s Jay Moxey rushed for three touchdowns while Julian Burris and Itabari Mason added rushing touchdowns. Burris also returned a kickoff for a touchdown for the Longhorns. Kell will travel Creekside in the semifinals after Creekside won the coin toss in what will be the teams first-ever meeting. The Longhorns have regular season victories over 6A Lassiter (region champ) and 5A Creekview, both were eliminated in the first round of the playoffs. Kell defeated Allatoona and Mays in the playoffs prior to downing Warner Robins.